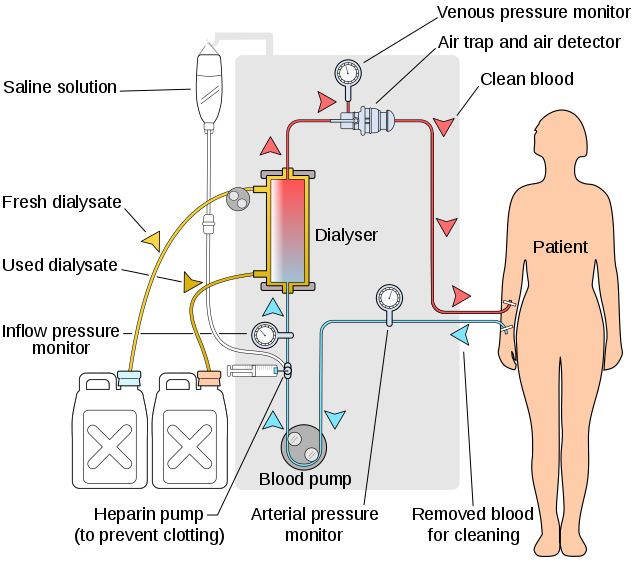 For millions of people in the United States, being attached to a kidney dialysis machine for hours on end, multiple times per week is reality. Researchers working to restore some normalcy for kidney dialysis patients, by developing a wearable system that would give them freedom of movement, are encouraged by a new finding about a material that could vastly reduce the size of the blood filtration system. With its atom-thin layers, MXene could be an effective filter for urea in wearable artificial kidney devices. Looking at just three of the 30 types of MXene materials that are already available, the study shows that they can remove 99 percent of urea from an aqueous urea solution and 94 percent from dialysate — the water that absorbs urea in dialysis. Portable dialysis devices, which have been in development for decades, still cannot accomplish the task of removing urea well enough. They also use an enzyme to break down the urea in the dialysate, into carbon dioxide and ammonia. The carbon dioxide must be carefully vented to prevent bubbles from getting into the circulatory system. And the ammonia must be absorbed by a special filter before it reaches toxic levels. All of this adds weight to a device that resembles a large tool belt and is meant to be worn continuously throughout the day.